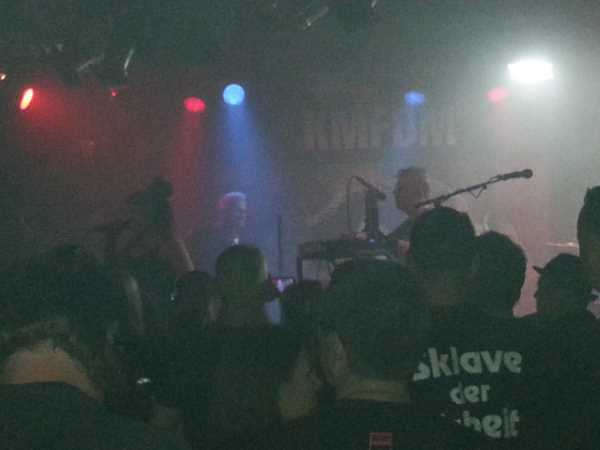 I am very sure this was my last gig with KMFDM for a very long time. No KMFDM-classics, only 1 hour appearance, bad sound - no recognizable electronic sound. Some weeks before I posted on Facebook that I would go to this gig and Anja - one of our best friends also joined this event. I was a little bit too late so we met inside when KMFDM already began. I went to the right side at the Nuke where there was some more place and some bar chairs to sit. After a short SMS with Anja about my location she was coming to my place. Five days before this special event I ordered two tickets for my wife and me. 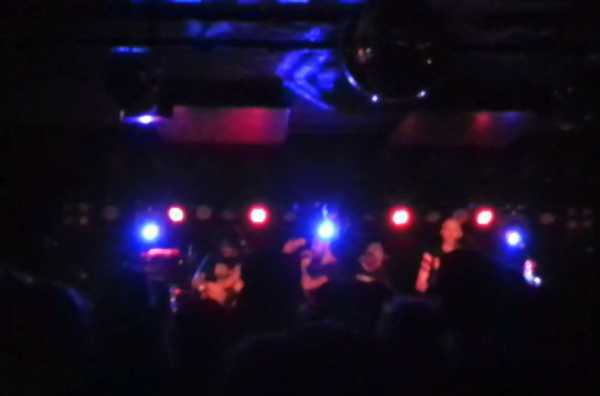 I was very excited to see DEFUNKT again at the Quasimodo - the legendary Jazz-Club in the centre of West-Berlin - after more than 3 years. The gig should start at 10 pm but we arrived there 15 min later - still with people waiting at the entrance. 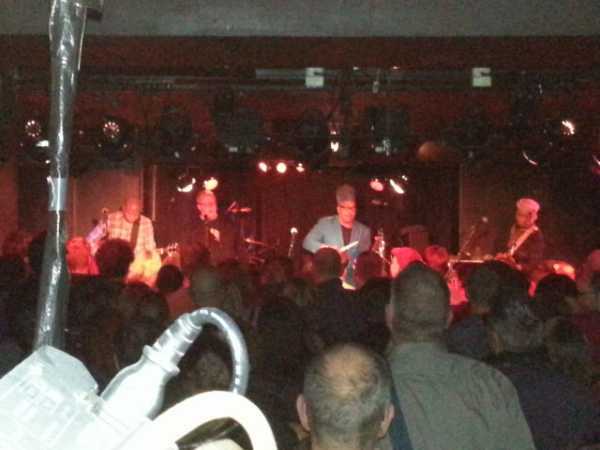 The gig was sold out therefore it was difficult to find a good place. We got something to drink when they started short after 10:30 pm. At the first song we didn't see much of the band so we tried to find a better place which was found near the sound amplifier - three steps more upper - so a good place to stay and to take some pictures and videos. Two or three years ago I had already tickets for Balkan Beat Box but I was totally ill and couldn't go to their gig. I gave the tickets to my wife and she took some colleque with her. She found it not that good because it was too loud for her. This year I was going alone because my wife couldn't come due to their work at evening school. I arrived at the Bi Nuu at 9:10 pm and they had already started. I ordered a beer and was looking for a good place to watch, listen and dance. 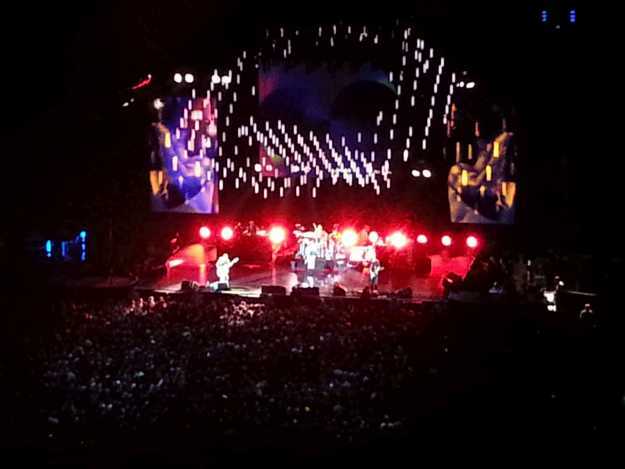 3 weeks before my wife and I tried to get tickets for the Red Hot Chili Peppers here in Berlin and surprisingly there were still tickets left for the upper ranges of the Mercedez Benz Arena. The view to the stage should be straight ahead so we decided to take two of the last tickets. It was a dry Thursday evening here in Berlin. I arrived early enough from work - gates were opened already at 6 pm but we were only two hours later ready to go - prepaired with our tickets and a little remote glass to have a better view to the stage. One bad point this evening was that my wife had strong headache but she said it would be ok.
We arrived at the MBA at 8:30 pm and a lot of people were still arriving so our thought was that they would not play yet. For a short moment we were shocked at entrance because the card checkers asked us while showing our tickets for our identification papers which we left at home but they were gracious and let us in. 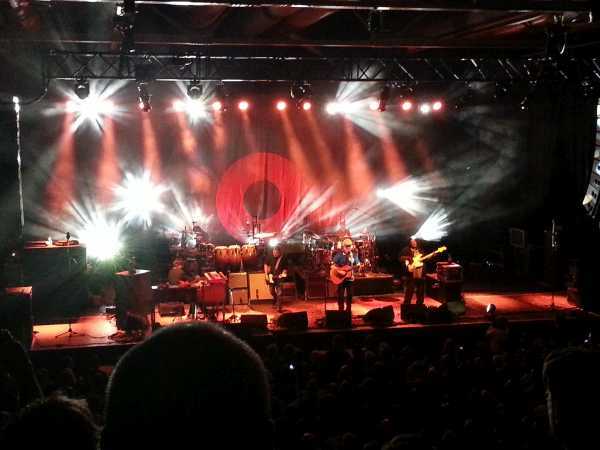 What a phantastic night - what an awesome gig. It took more than 2 years to see Dub Fx again after that two day special in 2014. I was not satisfied with their venue-selection. Two gigs years before with a bad accoustic made me feel sceptical that this gig would sound better but in the end I was instructed better. My job day ended as normal at 8pm when I arrived at home. I prepared myself for the gig (only neccassary´things were in my pockets). 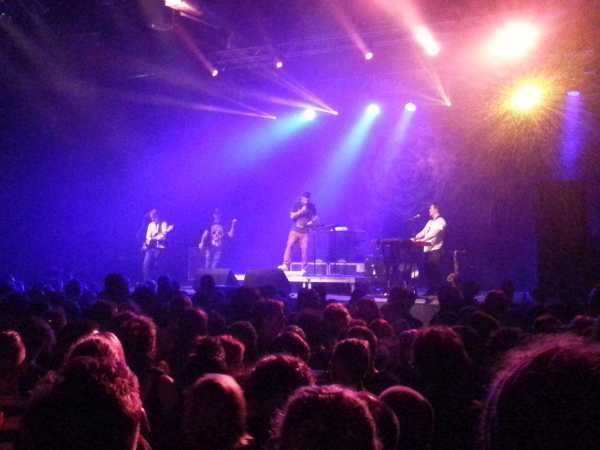 I arrived there a quater before 9pm when Andy V was making some good beats & grooves on the stage - also playing his sax. It took some time to get something to drink but than I found a good place on the right side - on the two steps stage where the bar was located. Two weeks before I asked my wife if she would like to come with me to Ben Harper. She didn't know him so I played some YouTube-Live-songs for her and she liked it. I ordered two tickets. We went there by foot - only 5min from our home - and were standing 15min in a long line of people who wanted to get in. 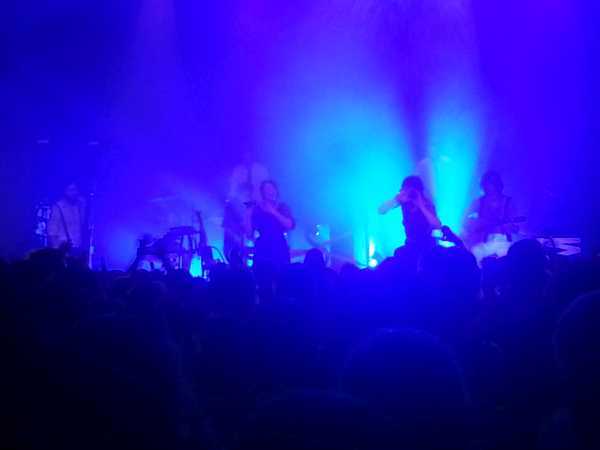 When we were inside a support band (sorry didn't know the name) was already palying. We ordered two beers and went outside to the beergarden to wait until Ben Harper would start to play. It was short after 9pm when Ben Harper & The Innocent Criminals started to play. Short before we were going to the empore to have a good place to stay and see the stage. 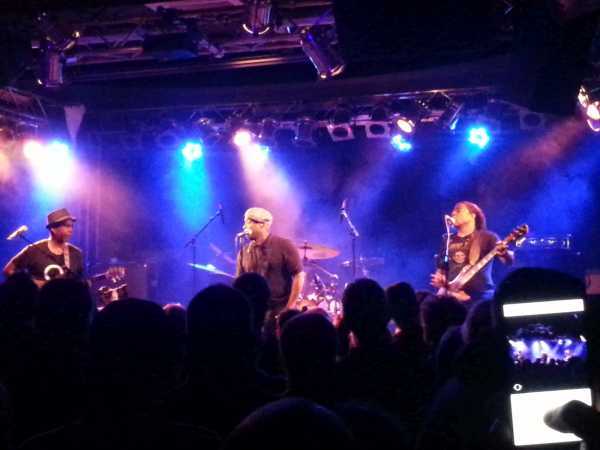 It was already fixed more than 3 months that my wife and I would go to see Living Colour this year. Also Anja who got a ticket from us as a birthday present would come with us. We arrived at the Frannz Club early enough and took a place in the back of the venue just behind the bar. Anja was coming some minutes later after Living Colour alredady started to play. Music was coming out of the speakers but no Living Colour on stage. I knew that song. It was WTFF from the Stain-record which I integrated in a mixtape from the 90’s. 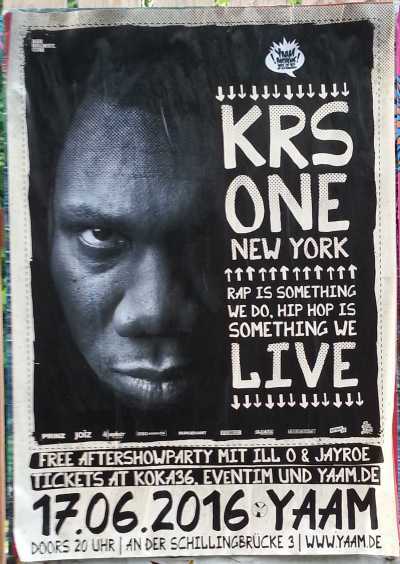 Finally at all I was disappointed - a bit - about that gig or about KRS-One - I really don't know - but let's start a little bit earlier. At the end of April I got a gig alert by one of the many ticket-gig-websites and it was told Berlin would be the only gig of him in Germany so I decided to go. Knowing my son's music taste I asked him (J.) if he would like to come with me. He said yes and asked if a friend of him (A.) could also come with us. So I bought 3 tickets. The day of the gig I was at home at 8pm from work so we decided to go there just in time. We took the bus and arrived at the YAAM 8:40pm. Before the entrance there was a maybe 50m long line of people waiting to get in. On a fence near us were hanging some gig posters also this one (photo). Inside everything was like the last time except the PowerAmplifier was surrounded by a framework with steps and a kind of empore behind the PA. I took a beer and went to the place I wanted to go from the first time - the fourth step of the framework at the PA. J. & A. were going more in front of the stage and danced there all the time. A DJ was already partying the people. At 9:15pm another DJ was coming on stage and the first one was taking his things from stage - so it wouldn't take long until KRS-One would appear. The DJ (later one KRS-One told that it is his son???) played some 80's and 90's stuff. It was getting louder and the place was filled with people. 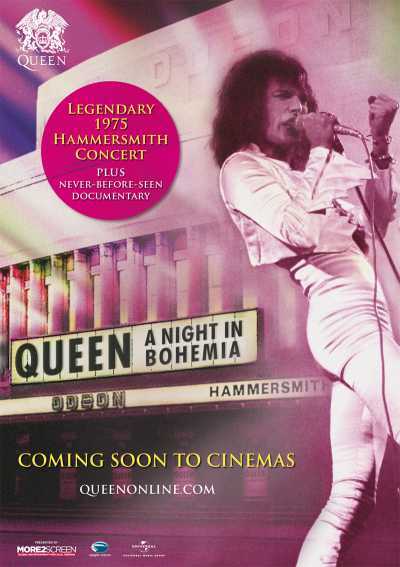 Informed by email alert two weeks before this documentary/concert-film about the legendary Hammersmith gig of Queen in 1975 should be shown at any UCI-Cinemas. I liked to go but not alone. My wife couldn't come so I asked Petra and Sven if they would watch some Queen stuff with me and - surprise surprise - they said yes. I ordered the tickets and was very excited to see a gig of Queen from that time. We met at the cinema 30 min before it should start - enough time to get something to drink. First they were showing a 45 min documentation about the foundation of Queen, how difficult it was in the first years and how it came to the "Bohemian Rhapsody". Then the film about the Hamersmith gig started. I was a little bit disappointed about the sound quality and that the gig only took 1 hour but remember this was Christmas and over 40 years ago. It was the first time where "Bohemian Rhapsody" was played live before an audience. I was happy that they also played some songs from their second album "Queen II" - especially "The March of the Black Queen" - one of my favorites of all times. Some days before Anja - a good friend of us - invited me via Facebook for the Caravan Palace gig at the Heimathafen Neukoelln. I knew already one song of this Electro swing band which was in one of Chico Alves podcasts at Podomatic - Outro Mundo 29 - so we decided to go there. I bought two online-tickets for me and my wife. On the day we met with Anja before the location where a lot of people were already waiting. It took some minutes before we could go inside the venue. The hall was already filled with a lot of people. We ordered some beer and were prepared for the gig.